Upon your diagnosis of COPD your life immediately changes, how you let those changes affect you is 100% in your control. Now the aspect of the course that COPD will take is of course out of your hands, however there are a few things that can be done to both better manage your COPD and most importantly help you breathe clearer and more efficiently. The following tips will help you better manage your disease throughout all stages of COPD and get you back to your normal daily routines. Quit Smoking Cigarettes (All Tobacco use) - Let your friends and family know that you are quitting smoking, this will keep you accountable and may even provide some motivation. If you are having difficulty quitting smoking or have failed numerous times, then speak with your doctor about potential treatment options. This also means staying away from friends or family that are smokers, the best way of going about this is to declare your home a smoke free zone. Reorganize - When reorganizing your home to better suit your needs, ask friends or family to move heavy materials or use a wheeled cart to reduce over exerting yourself. Move items that you use frequently in a convenient, easy to reach locations. Relax, Take it Easy - When moving throughout your home or while cooking dinner slow down to reduce the risk of irritating symptoms such as wheezing, coughing, or breathlessness. If you are ever doing household chores and you get light headed, or you begin to have increased breathlessness then use the breathing techniques below and sit down to reduce over exasperating yourself. 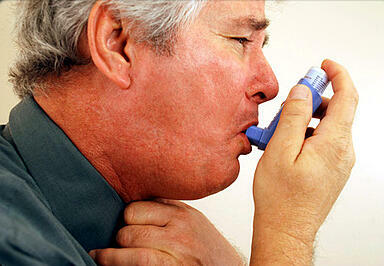 Air Purifiers - Purchasing an air purifier for your home is extremely proactive for your treatment of COPD. Adding a few of these throughout your home will filter out harmful dust and dander particles that can be potential COPD flare-ups. Stay on Top of Medications - Have a daily alarm or reminder that will notify you when to take your medications, aim to take medications at the same time everyday. Also keep a little reminder of dosage instructions, and have a pill separator filled for each day to avoid mixing up or incorrectly dosing medications. This also includes using your oxygen concentrator or tanks on their prescribed setting. Be Educated on Breathing Techniques - Being prepared and knowing different breathing techniques for times of short and quick breaths, will give you the ability to return your breathing pattern back to normal. Pursed Lip Breathing - This technique will slow your breathing, reduce the work of breathing, and allow the airways to stay open longer allowing trapped, stale air to escape. Diaphragmatic Breathing - This technique is not as easily mastered as pursed lip breathing, so speak with your doctor so a trained professional can teach you the proper technique. Diaphragmatic breathing is most effective when laying down or sitting back. As a patient it may feel that managing your COPD is in other words impossible and that your ability to breathe clearly has vanished. With the help of the previous tips you can learn how to better manage your disease that will help you breathe clearer and will allow you to return to your normal everyday activities. Before starting anything new talk with your doctor to make sure it will benefit your health, because as we know COPD affects every patient differently.